Ah Monday! It finally came. Both children back at school. Peace. I'm not so chuffed to be transporting them to school once more (I thought we were done with all that at the end of primary school). Whilst it is a legal requirement to be at school until you are eighteen now (I think apprenticeships might be the exception) you suddenly get treated like an adult when it comes to getting there. J still has his free bus pass but E's bus pass to the same school would cost a whopping £454! Bit silly. So, it's cheaper to take them both. Rather tedious though since the route goes past three primary schools and I end up crawling at 15mph for most of it. I've eaten some stuff I shouldn't have eaten lately and pretty much got myself back to square one. I ignored most of the problems until they became a bigger problem and then had a small strop about the lack of tasty gf food. One of the big issues is bread. M has baked a large number of gf bread recipes for me and none have come out remotely edible. So whilst moping around this morning I suddenly thought to contact my pal, the genius when it comes to all things gf, Tess. T suggested scones. I googled 'simple recipe for gf scones' and found one that used ingredients I already had. Half an hour later and they were done. They tasted better than they looked, in fact they tasted great, and what's more there is scope to bung in some cheese next time. Happy days! 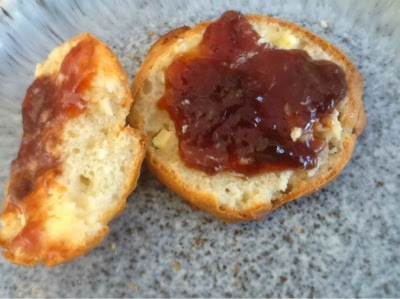 So sod the bread, I shall stick to scones from now on. The other thing I made was a gluten free oaty, sticky date thing. 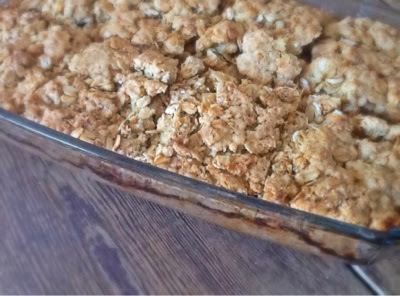 It's a layer of boiled to syrup dates in between two layers of oaty stuff. It smells far too buttery for my liking although I used dairy free butter. I may have to drown it in custard. Tomorrow I'm going to use up three ripe bananas and make sugar free flapjack, and a batch of cheese scones so I'll be stuffing myself with all of this and not missing tasty bread at all (who am I kidding?). Apart from baking I also spent my first back to school day walking the dogs. It was perfect weather. The tractors were out in force ploughing the fields for the next round of crops. I hope they plant something more useful than cattle grade broad beans. I have been known to come home from a dog walk with a pocket full of fresh peas! 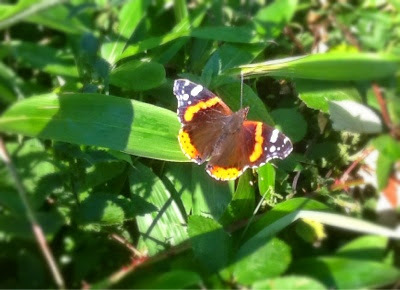 Our garden is full of Red Admiral butterflies at the moment. Masses of them and I could only manage to snap one in situ. Every morning there are twenty or so on our beech hedgerow. They quite like the bamboo too. We've never had this many before, they flutter round while I do a spot of crochet on the deck. Finally, just before picking up time I managed to squeeze in a film I'd recorded the other day. 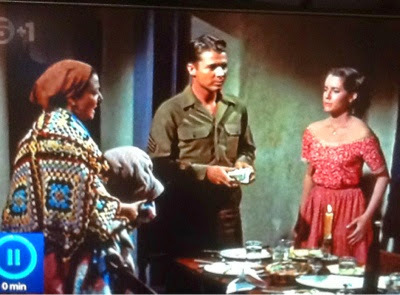 This guy (Audie Murphy) I usually see in cowboy films but this one was a WWII film and as ever I kept my eyes open for crochet! See that blanket? It's joined with some kind of lattice stitch. Any colour combination seems to go with crochet blankets! So, a lovely back to school day. Oops I forgot to do any housework. Oh well, that can wait. The scones look lovely. Baking is definitely more fun than housework.